A real mix of models this month as it seems that the mini world wakes up from the winter slumber. There are plenty of temptations for my elf, vampire and dwarf armies. So it's the pointy ears, pointy teeth and, er, pointy beards issue! 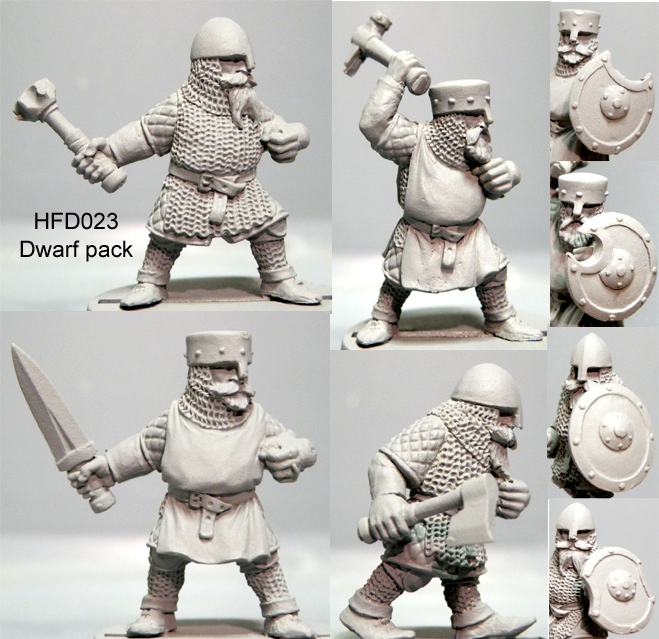 There are many, many dwarf minis around, but so many are sculpted as comedy gnomes or fat buffoons. 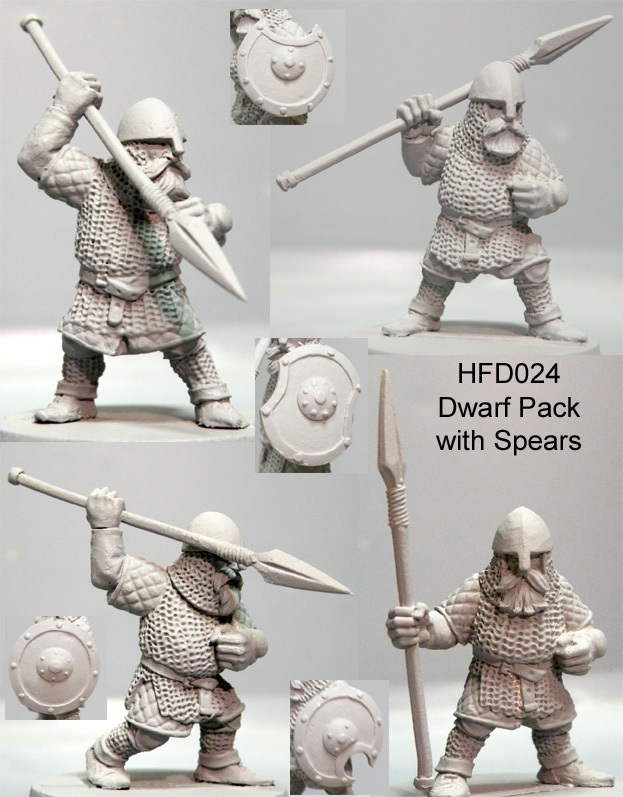 I was pleased to see that Hasslefree Minis have produced some dwarfs that really look like they are serious about battle. On the vampire front I noticed these bats from Titan Forge. There are alternative golems in their range that are worth checking out too. 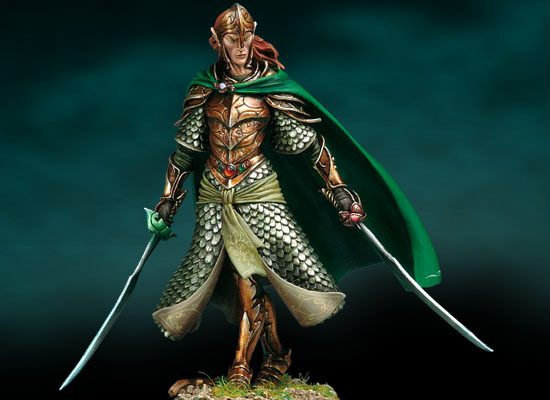 I am currently scanning around for some wood elf character models. Studio McVey have a couple of very tempting female elves. Sweet but deadly. 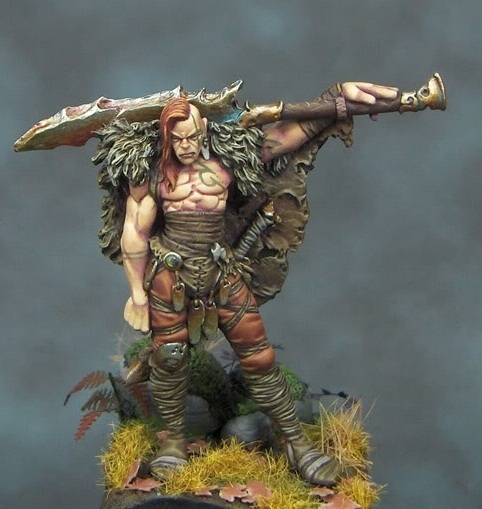 This Enigma Miniatures character is not strictly labelled as a wood elf but I reckon he would make a fine noble, though possibly a little static for a wargaming figure. 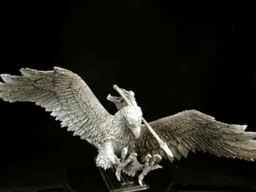 Gamezone Miniatures make some excellent wood elf characters mounted on some very impressive eagles. The best place to view the full range of Gamezone minis is on their youtube channel. This Andrea Miniatures elf has been in my sights for a couple of years now, one of the contenders for a 54mm painting project that I will eventually get round to. 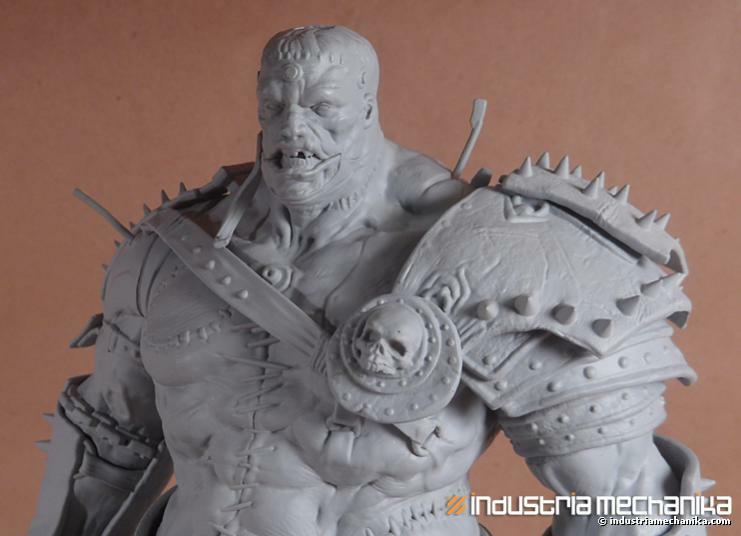 And last, but definitely not least, is this mind-blowing sculpt from Industria Machanika. Yes, it's 1/6 scale and thus about a foot high, but even so the detail is simply awesome. 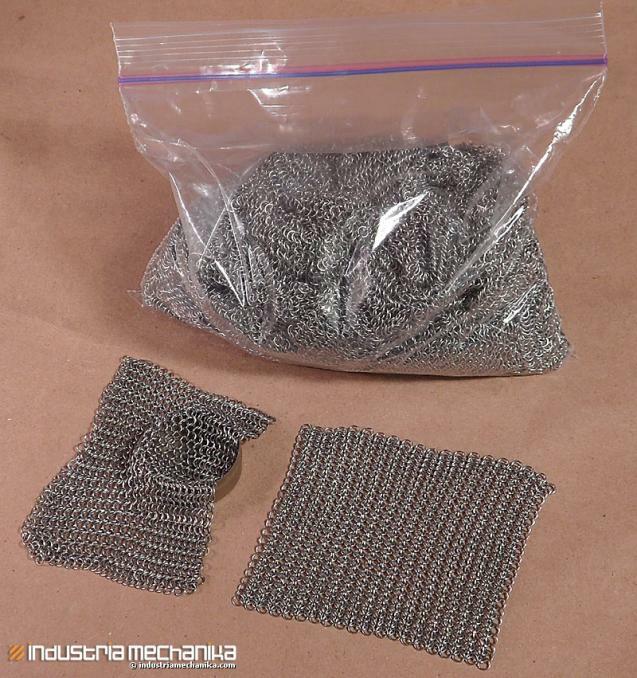 And it is actually provided with chain mail links! 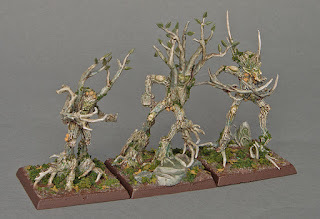 First unit of treekin painted. For inspiration on the colours I copied a Rowan tree, a light greyish brown bark colour with dappled white highlights. There are also a few patches of green and grey-blue which are quite difficult to see on the picture. The second unit is still to be painted, but I have to decide if I should repeat this colour scheme or try something else. 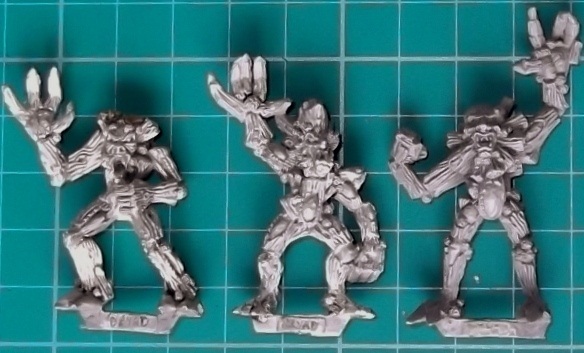 The second unit is more stocky in nature, more like oak trees, which might suggest more brown in the colour scheme. But then that would jar with the rest of the army. I will probably stick with the more uniform grey colour scheme. Possibly. Imagine you are a postman delivering mail to a small hamlet in the Warhammer world. You are unfamiliar with this particular village and have a parcel to deliver but don't know which building it is. It's obviously not one of the little hovels with an address like The Tower on the Hill, but luckily you spot a local yokel, hard at work polishing a pile of skulls. You stride over and ask him "Excuse me sir, can you tell me where I might find the Tower on the Hill?" "It's over there," he beckons, "through those blood soaked trees". You glance across and can just make it out in the distance. But you realise that there are not one, nor two, but three towers perched on the hill. They all look quite similar, so you ask for a further clue. "It's the one with the skulls on it," the peasant laughs and walks off, presumably to die a horrible death in the not too distant future. If you are happy with the proliferation of skull bedecked towers in the Warhammer world, then stop reading now. For those who would like a slightly less fantastical board to battle over, read on! I spotted a couple of pieces and it got me thinking that they would make a very nice hamlet. The windmill is by warbases.co.uk and if you click on the link you will see that it comes as a flat packed kit at a very reasonable price. You have to put in a bit of effort by making your own roof tiles, but it certainly looks an absolute bargain from the picture. 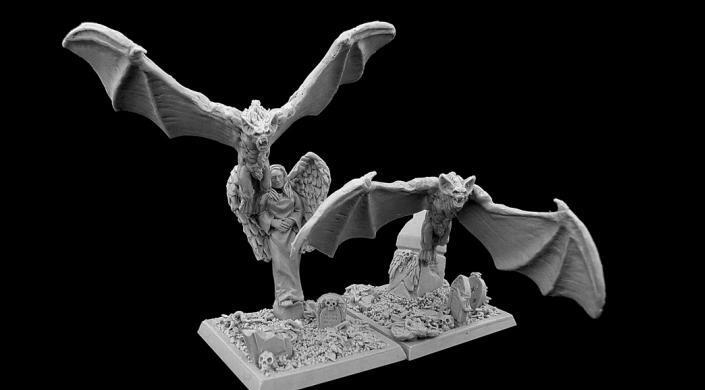 More angles and enlargements would not go amiss, but well worth a browse of the website, as they also make some rather nifty movement trays too. 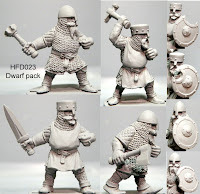 The second find for this post is a more familiar plastic kit in a similar vein to the GW range, but covering something I think has been missing for far too long. A set of ruined buildings, ideal for those run-down areas of the Empire or Bretonnia, not forgetting the classic Mordheim. It's based around ruined Normandy farmhouses, so could equally be used in WWII gaming, or Napoleonics, or even medieval wargames. It's produced by Warlord Games and is well worth a look. Imagine a small village built of these ruins, maybe include a GW chapel and graveyard with some bits from the Garden of Morr set, with the windmill as a centrepiece. 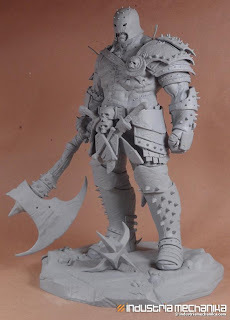 It's a mouth watering prospect and would make a brilliant centrepiece to an Undead or Empire army, or to any fantasy/medieval wargaming table. Well, we can all dream right? 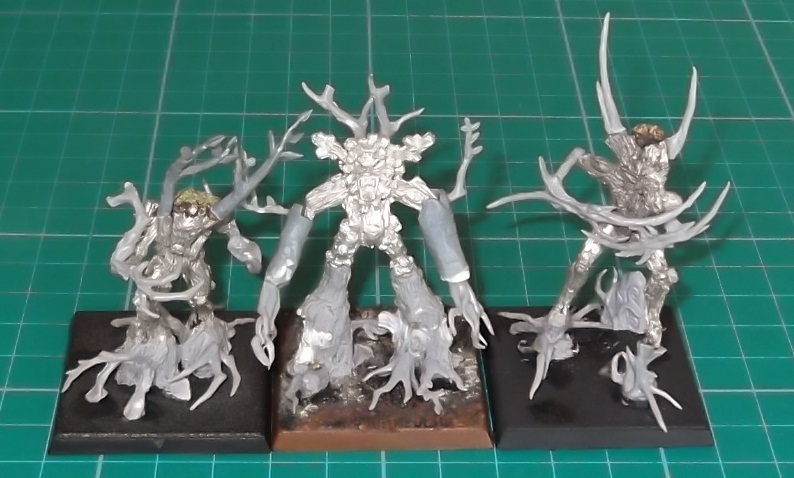 I have finished building the treekin, two units of three ready for some paint. Not the best photos I'm afraid, but you can see the basic construction work. One unit is loosely based on oak trees, short and solid. The other unit is more slender, not as weedy as birch trees, perhaps beech. I spent a spare afternoon over the weekend taking photos of my Wood Elves. I have decided to play them for a little while, just to get a complete break from the grindfest infantry armies like my chaos warriors and dwarfs. 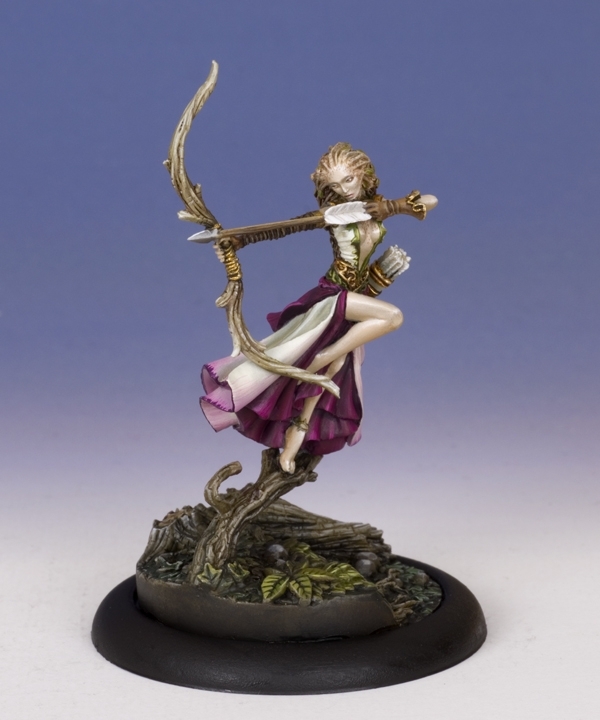 The elves were painted a couple of years ago, I recently spruced up the dryads a little and rebased the entire army. Let's start with a group shot of the Asrai. And some close ups of the elves. These glade guard are all painted fairly speedily, mostly a base colour and a wash, but they are good enough for battle. Likewise the wardancers have some parts that do not stand up to close scrutiny, but the skin and tattoos are the major feature and that's where most of my effort went. Finally there's a spellweaver and some scouts. 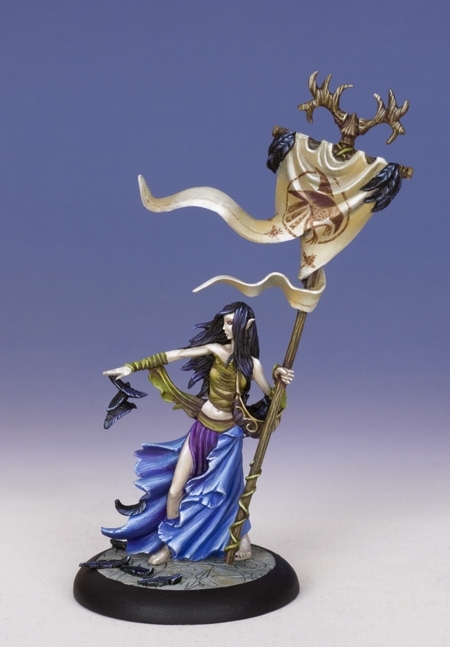 I need to find a decent model to act as my army standard bearer, and I would like maybe one other character, but I need to play a few games first to decide on what I need in this department. 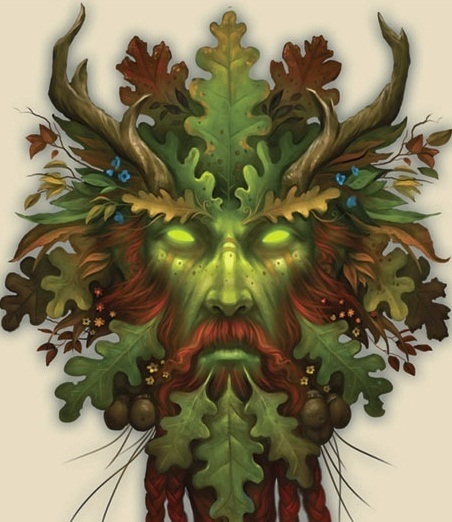 The other main component of the army is the forest spirits, so far two units of drayds, two units of treekin and a treeman. The dryads are pale, inspired by the white birch trees in my garden. Quick and easy to paint, I recently tidied them up a little and added the bright green swirls and eyes. 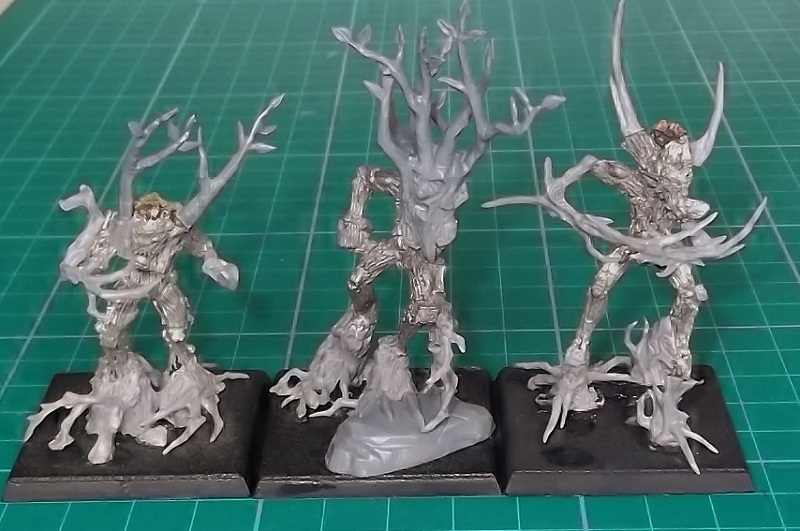 The treekin are converted from old metal dryads and new plastic bits, plus a few bits from Lord of the Rings ents. Last but not least, the treeman, converted in a similar way to the treekin, from an old metal treeman mixed with newer plastic bits. 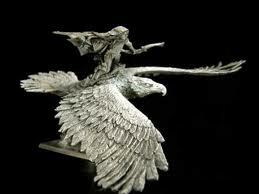 I have already posted separate pictures of the marauders and the sorceror that will lead them into battle. So there's not much new here, except that said unit and sorceror are now together in a nifty movement tray. 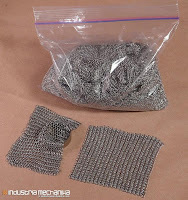 I know, I know, some folks will do anything to get their post count up. However, it's probably the last post on the chaos army for some time, so say goodbye to the chaos army, for a short while at any rate. I finished painting the chaos lord, the Banelegions Kraan model. It's sheer coincidence that mine looks superficially similar to the official scheme, after all the black armoured host of my chaos army was started over a year ago. And an ice bear is almost certainly going to be an off-white colour. The bear is definitely the best part of the paint work. It was quite easy to do too, just a few glazes and picking out the facial details and claws. Painting the armour plates was more time consuming, in hindsight it would have been better to partly paint these items before assembly. The black armour I tried to enliven by making it similar to daedric armour from the mighty Skyrim game! It worked a bit I think, but not as well as I had hoped. I think I rushed it toward the end, I seldom have the patience on bigger models, there's always something waiting in the wings that seems more enticing. At some stage I will get pictures of the rest of the black armoured troops on the blog. The marauders and sorceror I painted recently, plus the chaos warriors from about a year ago, and some hounds. I would like to add marauder horsemen to the contingent, they have been assembled but unpainted for so long, but my attention is now on elves. Sigh, I have a feeling it will be next winter before I get back to this army. Recently, I have been commission painting some High Elves in an Avelorn theme. It made me think back to my own elf army, started a couple of years back. At that time I had put it on hold because I was unsure how the army would play under 8th edition, but now I have a much clearer idea of the direction to take. One thing that I would like to include are treekin, but the official models are not the best sculpts, so I want to convert and build my own versions. 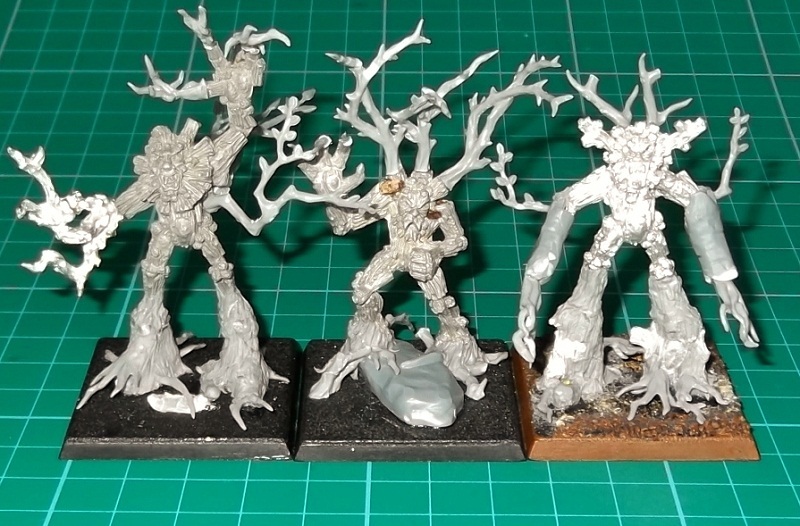 Thinking back to my converted treeman, I decided to have a go at a similar project for the treekin. Time to break out the tools and bits box. This is the basis of the conversion. These are old metal dryads from 4th or 5th edition, which I picked up on ebay for a couple of pounds apiece. 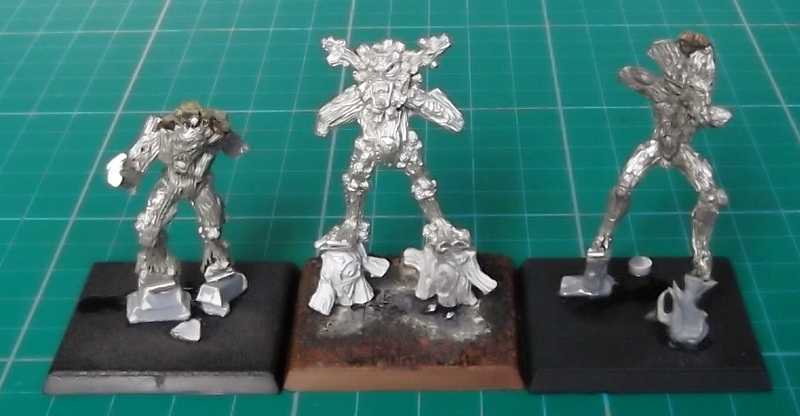 I had to strip off the paint, but that's easy enough on metal figures. The other bits required are mostly plastic spares from current dryads, a few bits of sprue and any other bits I could find that were tree-ish. Stage 1. I cut off the feet and hands, to remove any human like appearance. 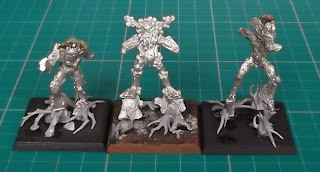 Then I added some support to the legs, to raise the height and to make it easy to fix the chopped off legs to the bases. I used bits of plastic sprue, old metal bits from a treeman model and even some wood elf dryad plastic bits. It looks rough now, but most of this will be covered in the next step. The important thing at this stage is the height and stability of the model. It must be rock solidly attached, so I left them overnight to allow the glue to set hard. Stage 2. 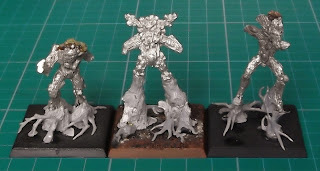 I added some roots, taken from the plastic dryad sprues. 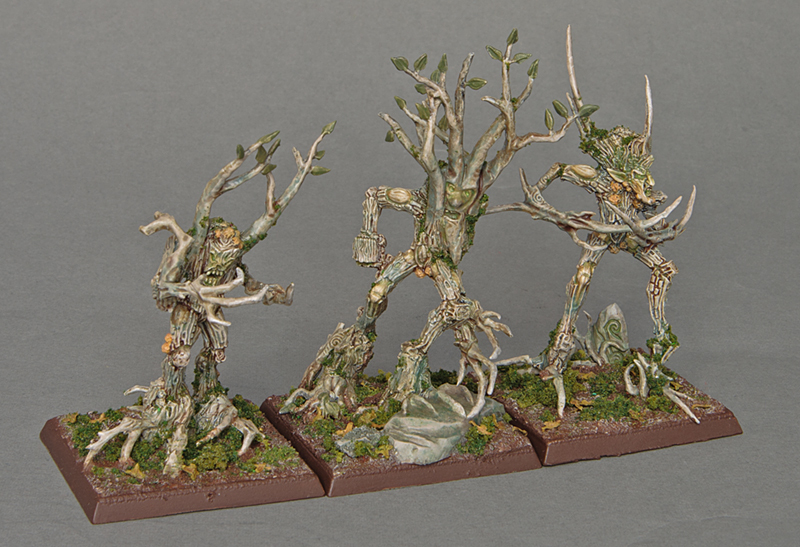 Mostly these were just branches, though I did also use a couple of trimmed dryad heads. Stage 3. This was the stage I was dreading, I added some grey stuff to the bases of the legs and sculpted in some basic bark textures. This turned out to be much easier than I had anticipated. I rolled out the grey stuff into a sausage, then chopped it into little bits, then squashed it into the gaps. When I had done all three in this way, I went back to the first to add the texture. The little pause in between applying and sculpting the grey stuff made it much easier, my top tip of the day! Stage 4. 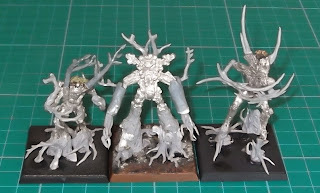 The final stage is to add limbs and branches, again using mainly dryad bits. I have tried to build each model in a certain style. The figure on the right is slender, with whip-like branches and long spikes. The figure in the middle is more stocky, with heavy "arms" and stubby branches. That on the left is, well I don't know what his theme is, that's trees for you. The mish mash appearance of the metal and plastic bits is a bit jarring at the moment, and I may smooth over a few joins with some grey stuff, but once the paint is applied I am confident these will look good. Another three to build and then I will slap on some colours. More woodland action to come in the next few weeks, not just from these treekin, but from a very exciting project I mentioned on Leap Day. More on that next time.